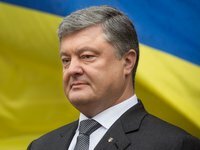 President of Ukraine Petro Poroshenko has held a phone conversation with the First President of Kazakhstan Nursultan Nazarbayev. During the conversation, Poroshenko noted a significant personal contribution of the First President of the Republic of Kazakhstan to the establishment and development of Ukraine-Kazakhstan relations. The two expressed confidence in the further strengthening of mutually beneficial cooperation on the basis of friendship and respect between the two countries and nations. As reported, Nazarbayev stepped down as Kazakh president on March 19.